Between leaving the farm and our start date at Mike’s Brewery (more to come on that later), we took a few days to be tourists since we really needed some rest and recuperation after our very stressful 4hrs/day at the farm! We hitched, quite successfully really, to the resort/destination town of Raglan which is situated on the central west coast of the North Island. Raglan is famous not only for its beautiful black sand beaches that are filled with a fine sand loaded in iron and other minerals, but also as a prominent spot for surfing in New Zealand. 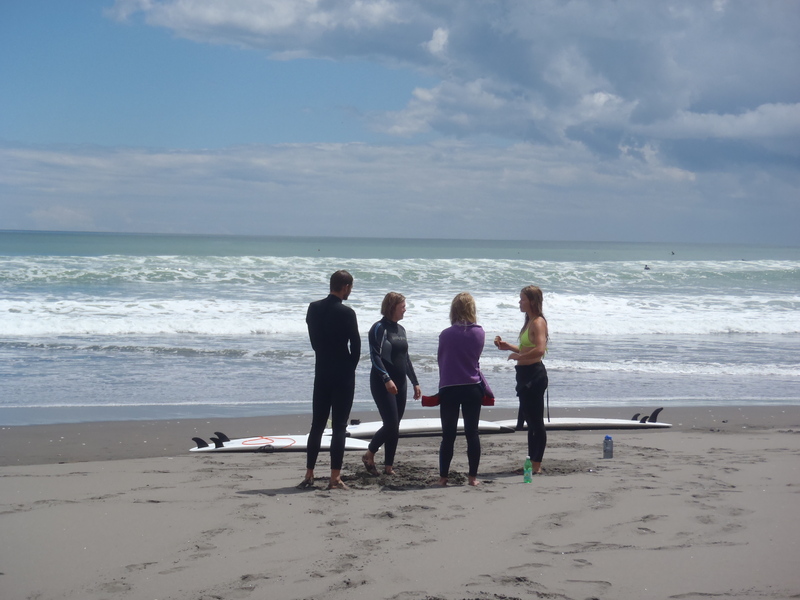 Raglan is to surfing in NZ what Whistler, BC is to skiing in Canada. We hung out for a couple of days, staying in hostels and practicing how to make the (usually) temporary friend that comes with hosteling. One of the days we attempted to surf which was only moderately successful – we flipped the hostel a couple bucks for a half day rental, they gave us some ratchet straps to hold the boards to the free shuttle, and then gave us the keys… Yes, the “free shuttle” turned out to be a 1989 Subaru Wagon that the most competent driver of the group got to drive to the beach – just be back by 2pm!! Although at the end of the day there wasn’t quite enough snow for either of us to be successful… give me skis any day! One interesting observation from our first experience in a surf town, especially a touristy surf town, is that ski bums and surf bums are pretty much the same people. They get up at 7am (hungover) to go get at least one run, maybe two if they are lucky, before having to go work and cater to the needs of the tourists with the money. Our hostel was staffed by a team of 5 surf bums, all on a rotating schedule so some could go surf in the morning and others could go surf in the afternoon… quite similar to the guys working in a season rental shop or those making snow up on the mountains. Just like being at the mountain, the locals did their thing and made it quite apparent that they were the locals while the tourists were supposed to stay on their half of the beach and not interfere with the people who A. Knew what they were doing and B. Had earned the right to have the good runs by living there. 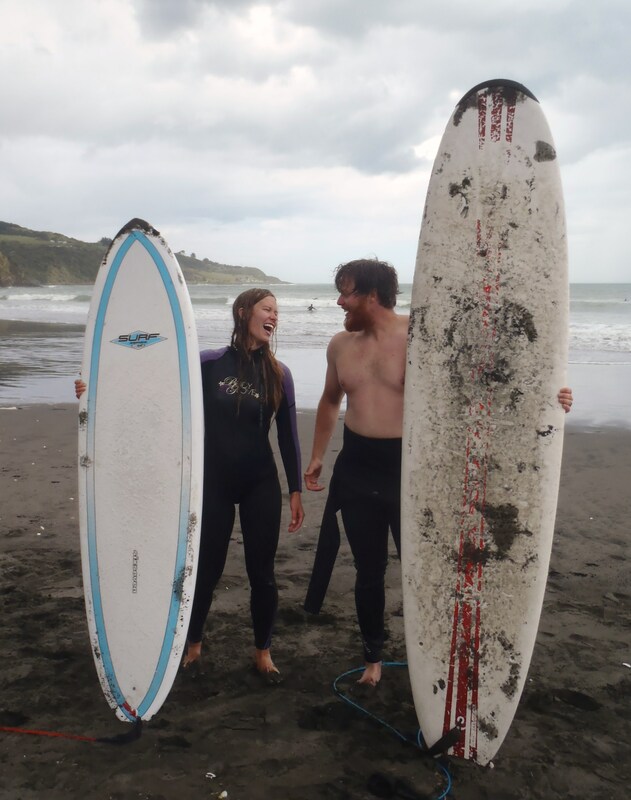 The locals were out in the deep water where the perfect big waves were….we made sure to be polite and stick to the baby waves that crash into the shoreline most of the day (that’s our excuse anyway)! All in all, spending two days in surf town ended up being a great experience – another one of the touristy things you must do when you’re traveling. It was just quite interesting to see how similar the culture of Surf Town, NZ and Jackson Hole, WY really were.